Guernsey Nos. 9 (1945) and 22 (1946) to (1947). 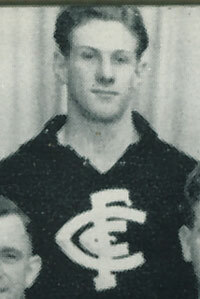 Defender Walter ‘Wally’ Alexander joined Carlton from Wodonga in 1945 – the last year of World War II, and a football season famous for Carlton’s victory in a brutal Grand Final clash with South Melbourne. Wally made his debut wearing guernsey number 9 and playing on a half-back flank in the first match of the season; a 21-point defeat by Melbourne at Princes Park. From then on, wins became more frequent for the Blues. In September, just weeks after Japan’s surrender brought the war to an end, Alexander appeared in his eighth senior game when Carlton won a tough Semi-Final by 26 points over North Melbourne. He was the team’s nineteenth man that day, and more than likely spent most of the match wrapped in a dressing gown on the boundary line. The following week, he was omitted from the team in favour of rover Jim Mooring, and therefore missed out on two of the hardest and most spiteful VFL/AFL games ever played; the ‘45 Preliminary Final win over Collingwood, and Carlton’s infamous ‘Bloodbath’ Grand Final triumph a week later. In 1946, Wally swapped to guernsey 22, but could manage only five more games in the next two seasons. Therefore, in July 1947, as Carlton gained momentum towards another Premiership, Alexander played his last match for the Blues - at full-back against Footscray at the Western Oval. In another close contest, Carlton’s spearhead Jim Baird kicked six goals to get the Blues home by 4 points. In 1948, Wally Alexander crossed to Fitzroy, where he notched up seven more senior games to round off his career. Alexander also played for Parkville Juniors and Footscray District. Alexander also wore Guernsey No.35 when he played with the Carlton reserves team in 1944. Contributors to this page: Bombasheldon , molsey , p(12)terg , PatsFitztrick , WillowBlue , keogh , Jarusa , true_blue24 , Juzz and admin . Page last modified on Friday 31 of May, 2013 21:49:41 AEST by Bombasheldon.